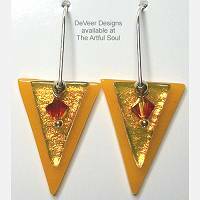 The designers available at The Artful Soul make so many styles of earrings, but this page gathers samples of hoop style earrings in both gold and silver! 1 inch synthetic resin disk is clear with pearly wash on the back, it lights up the lime green and purple nautilus pattern within. Suspended from 7/8 inch silver wire hoops. 1 inch brass circles have scrolling cutout pattern in richly textured golden surface. 1-1/2 inches long on goldfill earwire. 1/2 inch resin buttons are suspended from thin silvertone 5/8 inch semi-hoop earrings with post. One side of the button is metallic, the other is glossy, in vibrant turquoise teal colors. The end of the hoop is stopped so that the button will not come off in wearing, but you can slip off the post-side and reverse which side is showing, 2 different looks! 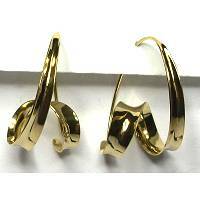 1 inch sterling silver hoops have hinged openings and slip-tight locking mechanism. 2mm thick, designed to wear with ear charms that can slide on and off for quick wardrobe changes. Sold as a PAIR, ear charms not included (available separately). 1/2 inch sterling silver hoops have hinged openings and slip-tight locking mechanism. 2mm thick, designed to wear with ear charms that can slide on and off for quick wardrobe changes. 1 inch long x 1/2 inch wide sterling silver hoops are squared oval shape twisted a half turn for a lovely dimension. They have hinged openings and slip-tight locking mechanism. 2mm thick, designed to wear with ear charms that can slide on and off for quick wardrobe changes. 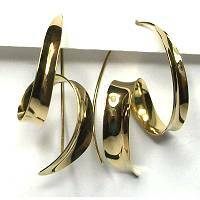 2-1/4 inches long, 1-1/8 inch wide, these hoop style earrings feature a heavy gauge wire bent at the top and flexible to work into slot at top of the bottom tubes to stay closed. The bottom tubes bent in a V-shape have rhodium silver plated finish. 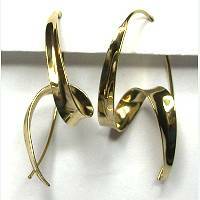 2-1/4 inches long, 1-1/8 inch wide, these hoop style earrings feature a heavy gauge wire bent at the top and flexible to work into slot at top of the bottom tubes to stay closed. 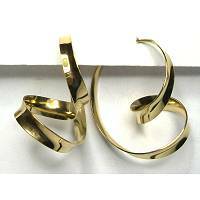 The bottom tubes bent in a V-shape have matte gold plated finish. 1-1/2 inch hoops of 3mm round Italian acetate, ultra strong, flexible and lightweight, surgical post and earnut to wear on pierced ears. The color is tonal shades of ivory. Transparent purple synthetic resin is shaped into these hoop earrings with post, sparkling lime green crystals along the center. 3/8 inch wide, drop 7/8 inches. 1/2 inch resin buttons are suspended from thin silvertone 5/8 inch semi-hoop earrings with post. One side of the button is metallic, the other is glossy, in vibrant amethyst/lavender colors. The end of the hoop is stopped so that the button will not come off in wearing, but you can slip off the post-side and reverse which side is showing, 2 different looks! 2 inch hoops of 3mm round Italian acetate, ultra strong, flexible and lightweight, surgical post and earnut to wear on pierced ears. The color is tomato red. 1-1/2 inch hoops of 3mm round Italian acetate, ultra strong, flexible and lightweight, surgical post and earnut to wear on pierced ears. The color is black. 1-1/2 inch hoops of 3mm round Italian acetate, ultra strong, flexible and lightweight, surgical post and earnut to wear on pierced ears. The color is tomato red. 1-1/4 inch long x 3/4 inch wide sterling silver hoops are elongated oval shape. They have hinged openings and slip-tight locking mechanism. 2mm thick, designed to wear with ear charms that can slide on and off for quick wardrobe changes. 1-5/8 inches long on sterling earwire, 3/4 inch across. The wire is bent into squared oval to extend from front design, through ear, and caught in the back with self-hook to form closed loop. A pair of glass triangles swing freely in opaque tangerine orange and iridescent clear with orange crystal bead. 1-3/8 inch long x 1-1/16 inch wide sterling silver hoops are big diamond shape. They have hinged openings and slip-tight locking mechanism. 2mm thick, designed to wear with ear charms that can slide on and off for quick wardrobe changes.